Stamp Happy Felicia: Happy Halloween! This card was made for my upline's monthly card swap with a Halloween theme. On the inside "Happy Boo to You" was stamped and embossed in Only Orange. I love decorating for Halloween! This year the kids and I are going to hand out candy rather than be in the big crowds trick or treating. I've promised them pizza, candy and a fun time! 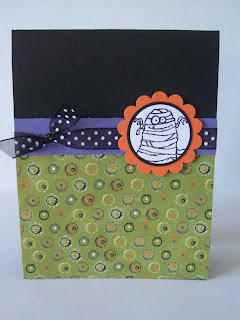 Card ingredients: Basic Black, Only Orange, Lovely Lilac, and Whisper White cardstock, Scallop, 1 3/8 & 1 1/4 inch circle punches, Booglie Eyes stamp set, black & white polka dot ribbon, DP halloween paper from last year's collection.